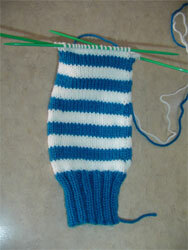 I had this pattern for tube socks and I really wanted a simple project to do after all the work on the bag. I am using yarn from my stash as I promised to do until September. I love making socks for myself because I have pretty big feet and I customize the length so they fit me. The pattern has smaller sizes for children so I think I’ll make a few pairs for the girls too.